Susan ‘Lily’ Yeats (1866-1949) was born in Co. Sligo, to John Butler Yeats and Susan (née Pollexfen), Elizabeth ‘Lolly’ Yeats (1868-1940) was born whe the family had relocated to London. Lily was the second eldest of the Yeats siblings, born after William, Elizabeth was third, and then came Jack, the baby of the family. Despite the later success of the brothers, early life was difficult for the Yeats siblings, their gifted father, a portrait artist, struggled to bring in a steady income to support the family, due in part to his bad business sense, and his arduous painterly method. Their mother, having come from an affluent merchant family struggled with ill health as a result of stress, and died at the relatively young age of 59 in 1900. As a result of their father’s failure to support his family adequately, early on the Yeats children adopted a strong work ethic, and worked to support the family as soon as they were of age. Irish cultural life in the nineteenth-century was marked by a growing sense of national identity, which manifested itself in the literary revival and to a lesser extent, the applied arts. The Celtic Revival took place on several widely different cultural levels which overlapped due to their common aims and impulses and also because they involved many of the same people. A considerable number of organizations were founded all concerned with one aspect or another of Irish culture. The Arts and Crafts movement provides a distinctive visual counterpart to the better known literary Celtic revival. Nationalism dominated the revival, both literary and artistic throughout the century. While the Yeats family lived at Bedford Park in London, they became acquainted with William Morris, the craftsman, and his family. In 1888, Lily begun working for Morris & Co. under Morris’ daughter May. It was a dark period in Lily’s life, as her diaries recall, May was a domineering employer, she found the family atmosphere oppressive, and she worked long hours at the embroidery. Her talent was evident, as she moved from the position of seamstress to being May’s assistant. She continued to work for Morris & Co. for six stressful years. Her scrapbook and letters to friends describe May as ‘The Gorgon’. Despite this, Lily enjoyed the work and excelled at it. The most famous piece she worked on was her contribution to the elaborate bed hangings for Morris’ bed at Kelmscott Manor, which were then exhibited at the 1893 Arts and Crafts exhibition. Elizabeth worked as an art teacher in London, whilst learning the craft of book printing. 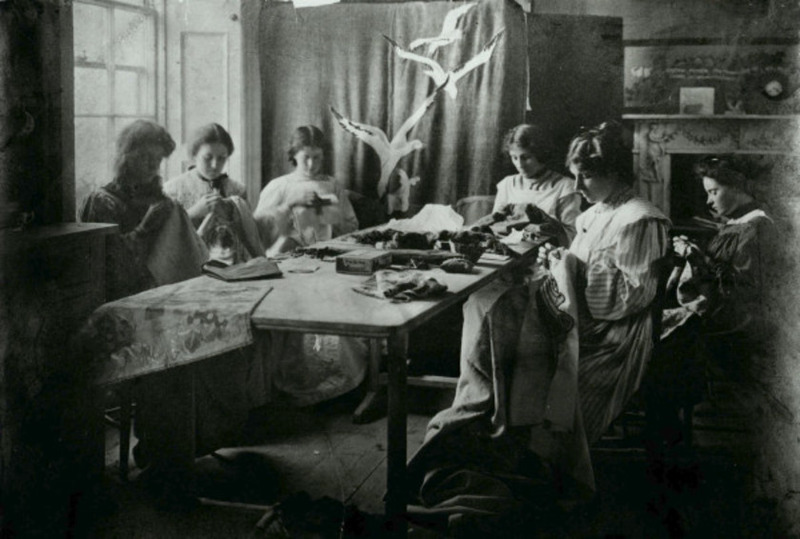 The sisters’ achievements are best remembered by their involvement with the Dun Emer Guild, which pioneered Irish Arts and Crafts at the turn of the century. Irish Arts and Crafts was the distinct visual counterpart to the better known literary revival. The Dun Emer Guild was founded in 1902 by Evelyn Gleeson (1855-1944) and the Yeats sisters, in Dundrum, Co. Dublin. The name Dun Emer (Fort of Emer) was named for the Lady Emer, wife of the hero Cúchulainn, renowned in Irish folklore for her beauty and artistic skills. The crafts of the guild were inspired by the native Celtic vernacular, popular at the time. The craft collective was formed under the medieval guild model favoured by William Morris. Its aim was to ‘find work for Irish hands in the making of beautiful things’; along with the hopes of educating young Irish girls so they too could pass on their acquired skills. The strong involvement of women, was a characteristic element of the Irish arts and crafts movement, be it as craft workers, designers, artists or patrons. The Dun Emer Guild’s designs were described (in its 1903 prospectus) as in keeping with the tradition of Celtic ornament being new and innovative. These designs were a rethinking of tradition, as it manifested itself in a country with a fractured colonial past. The translation of folk art became a basis for a national style. The association of Celtic symbolism with nationalist ideals was prevalent from the 1860s onward and was even more explicit with the interpretation of the Celtic style in the 1890s by groups working for Ireland’s cultural and political independence. Dun Emer looked to a more poetic, but progressive form of Irish art, sharing the same aspirations as the other European Art Nouveau movements. It becomes clear that it was not merely on matters of design that these groups were divided, but also by class and political allegiance. The Yeats sisters, though middle class, laboured alongside their assistants in the making of their craft items. The intention was that within the guild, each of the ladies would be involved with a particular craft. Lily would manage the embroidery, Elizabeth, the printing department (Dun Emer Press), while Evelyn managed the tapestries and rugs. Work progressed enthusiastically at the beginning, and a number of young ladies were recruited as workers and trainees. The guild exhibited regularly at a number of exhibitions, including some overseas (St. Louis World’s Fair, 1904). Their work was acclaimed in national and international press, and they received many prestigious commissions, including one for embroidered vestments and a series of 24 banners for Loughrea Cathedral, Co. Galway. These were designed by George ‘AE’ Russell, Jack B. Yeats, his wife Mary Cottenham Yeats and Pamela Coleman Smith, an American artist. Eventually, the personal relationship between the sisters and Evelyn Gleeson became strained over financial and administrative matters. In 1908 the sisters decided to take their part of the business and formed the Cuala Industries in nearby Churchtown. Elizabeth Yeats had initially begun her career working with William Morris, founder of the Kelmscott Press, and Cuala took inspiration from Morris’s Arts and Crafts movement. Unlike most Arts and Crafts presses, however, the Cuala Press concentrated on publishing new works rather than established classics, often by writers associated with the Irish Literary Revival. It published books by their brother W.B. Yeats (who acted as editor for the Press), Ezra Pound, John Millington Synge and Patrick Kavanagh. The Cuala was unusual in that it was the only Arts and Crafts press to be run and staffed by women. 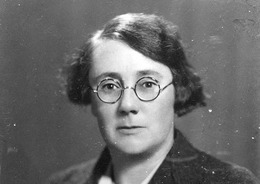 The Cuala Industries continued after Elizabeth’s death in 1940, run by William’s wife George Yeats, and one of Elizabeth’s former assistants Mollie Gill. It continued to print books until 1946, when the printing ceased. They produced prints and cards until 1969. Some of Lily’s embroidery work can be seen at Kelmscott House, Loughrea Catherdral, and at the Yeats Society Building in Co. Sligo. Editions of the Cuala Press can be viewed in the National Library. Callen, Anthea, Angel in the Studio: Women in the Arts and Crafts Movement, 1870-1914. (London: Astragal Books, 1979). Larmour, Paul, The Arts & Crafts Movement in Ireland. (Belfast: Friar’s Bush Press, 1992). Paterson, Emer Cheasley, ‘Crafting a National Identity: The Dun Emer Guild, 1902-8’ in The Irish Revival Reappraised, eds., B. T. FitzSimon & J. H Murphy. (Dublin: Four Courts Press Ltd, 2004).